I have just read this article in the Guardian. Apparently the Toy Retailers Association have come up with a top 13 list of toys. The article implies that it is in fact a list of ‘must have’ toys to buy our children for Christmas this year. Given the timing of the list, this seems quite plausible, and a quick Google search brings up umpteen other articles on the same topic and with the same angle, including one that has appeared on children’s television channel CBBC’s website. It seems that not only are adults being told what to buy for their children, but children are being told what to want. How many adults will fall for this blatant commercial manipulation? If this article‘s anything to go by, quite a lot. 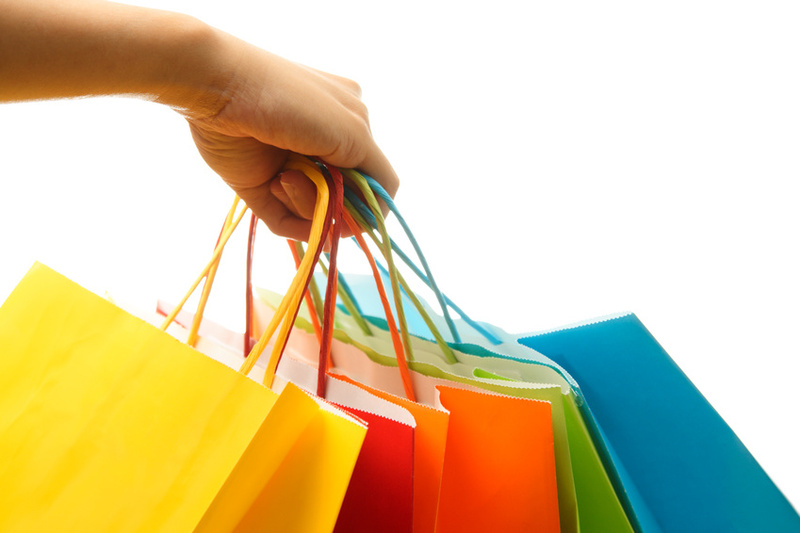 It reports that according to research by the Mothers’ Union, 72% of parents admit to buying gifts they can’t really afford, 46% have got into financial difficulty or debt in order to buy Christmas presents, and 59% admit to buying presents they didn’t consider age-appropriate. a) He will gets loads of gifts from grandparents, aunties, and uncles, and he won’t know that none of them are from me, because he thinks they’re all from Santa anyway. And I don’t feel in the least bit guilty about this. It’s not like I never buy him anything. Why wait until Christmas? I don’t get extra pay at Christmas or anything. And I don’t use Christmas as a bribe or a threat. My child doesn’t have to earn things. The idea that I must buy him heaps of things at Christmas means I must either hold off buying things in order to store things up to add to an already large pile of presents at a particular time of year, or, if as I do, I buy him things as and when he grows out of something or I feel he needs or would benefit from something, I must then buy him other things at Christmas which he doesn’t really need. I don’t get it. b) He won’t have any of the above ‘top 13’ toys or other demands for particular toys on his list because he never watches TV commercials. Children only expect what they’re led to expect. I ‘ve often found the smallest and simplest presents have been his favourites. c) There are very few toys he actually plays with anyway. Really. It’s taken me a few years to finally grasp this, but he doesn’t. For years he’s had a load of toys in the house he’s hardly touched. I sold some of them at last month’s NCT sale and he still hasn’t noticed they’ve gone. He just plays with, well, stuff. If he’s playing at cooking he plays with the real crockery and utensils in the kitchen. Forget all that plastic rubbish I bought when trying to create a ‘home corner’. He ‘goes shopping’ with real shopping bags and food from the food cupboard. He makes miniature ‘soups’ with various ingredients donated by his father while he’s cooking. He makes all sorts of imaginary things outside in his messy play area. He invents things out of cardboard packaging. He and his friends make dens with old blankets and cushions. Right now he’s obsessed with football, and will play imaginary matches with commentary. If no balls are immediately available, he uses anything kick-able. When he was younger he liked taking random things out of drawers and playing with them. (actually he still does) . He had a great time with the tape measure. I once found him playing with a roll of Sellotape. I took it off him, telling him it wasn’t a toy and we needed to save it for when it was needed. Later I thought how ridiculous that was. I’ll buy him toys, but I can’t stretch to an extra roll of Sellotape?! The thing is, kids have great imaginations, and a great capacity to create play out of raw materials. Plus this makes for a good type of play that’s most beneficial to their development. Many commercial toys do all their thinking for them, and limit them to playing in certain ways. Hi-tech toys do not encourage creativity or leave room for a child’s imagination to get to work. A toy gun can only ever be a gun. A stick could be a gun, then later a fishing rod. Children with large numbers of toys will flit from one to the next, without spending much time on any, making for short attention spans. I’m not saying we shouldn’t buy any toys, or that my child doesn’t have anything to play with. He has bats and balls, a scooter and bike, lego, drawing materials, a collection of toy cars picked up in charity shops, a dressing up box, a much used sand and water tray, for example. I’m just saying our approach to children’s Christmas gift buying, and toy buying generally, is worth thinking twice about. We often hear the complaint that a small child is more interested in the packaging than the actual toy. This is telling us something. Let’s take note, and send the media and the TRA packing. Some months ago I was moving some old plant pots about, some of them still filled with compost, and being undecided on where to recycle the compost I put them at the side of the house ‘for the time being’ (you know, the way we dump things in the spare room……). Lo and behold, I have created a messy play area. 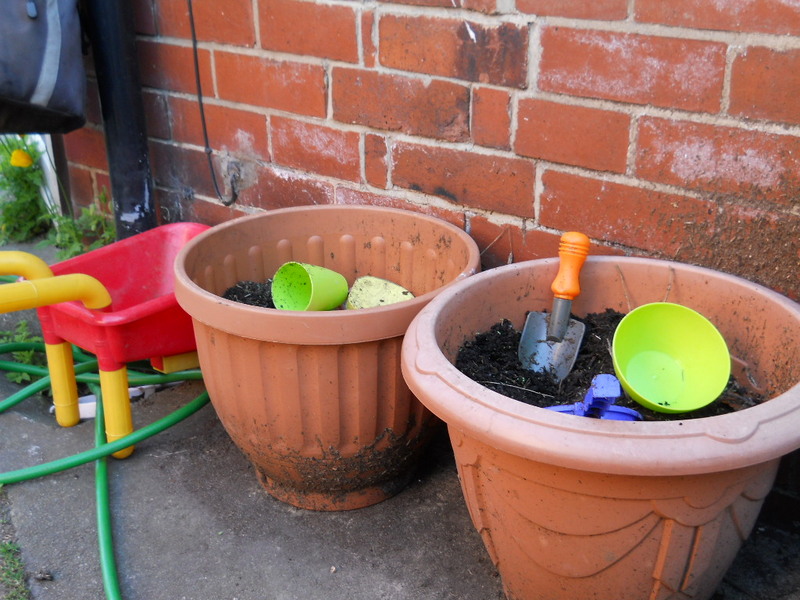 My child and his friends from neighbouring houses, aged between 3 and 7, love playing with these pots. They have become quite a fixture. Little spades, cups, diggers, and other things have been added, migrated from the sand pit mostly. Sometimes they like adding water, sometimes they move dirt from one pot to another, sometimes they run up and down the street with a toy wheelbarrow, collecting items (mostly stones and leaves as far as I can see) for their potions or soups. They mix with sticks, they serve up bowls and plates of various delicacies. I’m not always sure exactly what they’re doing, but they are always busy and intent and often working together as a team, like a nest of ants, on an imaginary mission of some sort. They love it, and I love it too – they’re happy, busy, having fun and engaging in some good creative, natural play. What’s not to like? Well, apparently, plenty. Not all the neighbours* share my love of the messy play area. I’ve considered moving it (for about 2 seconds) in order to maintain neighbourly relations. I’ve heard objections to painting house walls with old paint brushes and toy brooms, objections to spraying cars with water (?! ), and most of all, objections to children becoming wet and muddy. Now, I don’t know if I use all my empathy muscles up on parenting my child, but I admit I’m really struggling to empathise with this one. There are various types of play and ways to play, and the way I see it is that natural, creative, messy play is one of the best. To restrict this is to curb children’s natural creativity and inclination to play, explore, learn and use their imaginations. So before we restrict, I think it’s worth stopping and asking why we’re restricting, and if it’s worth it. Usually it’s because we know we’ll have to deal with the mess, so it’s about our own convenience. OK, everyone has a point at which they feel enough is enough, we’re tired, we’ve got a zillion other jobs to do, usually also related to cleaning up after the kids, but think about it. Mud washes out. Their clothes will most likely be going in the laundry basket at bedtime anyway. Unless we’re about to go out, what’s the problem? And we can always facilitate the play by providing wellies, or an old coat or apron for example. Do we really have a good enough reason to say no? On one occasion the kids emptied out a huge pot of compost onto the middle of our drive. Neighbours looked in wonder as they passed. It took 3 minutes to shovel it back into the pot before we could get the car out. Worth it? I think so. And I’m sure if I’d asked them to do it they’d have done so with enthusiasm. There’s also the issue of creating a general attitude about dirt. Personally, I don’t want my child to be worried about it. I make a point of using second-hand clothes as much as possible. I never buy anything white, and if it’s given to me it goes straight into the NCT sale. (Why design children’s clothes with white collars and sleeves anyway, and whose idea was it for children to wear white polo shirts to school?!) I think if a child is frequently told not to do things because they’ll get dirty they can become preoccupied with cleanliness, suppressing their natural curiosity and desire to explore, experience things and just, well, be kids. Yes, there’s a time and a place for messy play, but I think we should ensure these times and places are maximised, not minimised. Worrying about dirt and mess is an adult thing. Children shouldn’t have to worry about getting dirty – there’s plenty of time for that later. For now, they’re children, and their business is to play. *The neighbour referred to was made aware of this post before it was published.